Many roofing companies in Northwest Indiana have their hands full when it comes to the winter season, as snow keeps building up on roofs. Having ice and snow on your roof can create complications with regard to the gutter and heating systems inside your house. According to a Wikihow article entitled “How to Prevent Roof Ice Build Up,” ice dams prevent water from being properly drained from your roof. These produce pools of water that seep into the inner parts of the house and eventually damage walls and ceilings. While it is very important to remove ice from your house, it would be great if you take the necessary precautions first. 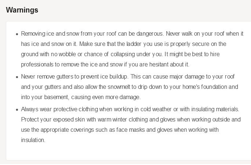 Removing ice and snow from your roof can be dangerous. Never walk on your roof when it has ice and snow on it. At this point, it’s better to have a professional clear the ice and snow for you to avoid injuries. If you want to do it yourself, use a stable ladder from the ground to remove the ice and snow. Never remove gutters to prevent ice buildup. This will allow the snowmelt to drip down and seep into your home’s foundation and basement, causing even more damage. Remember, gutters don’t cause ice dams. Always wear protective clothing when working in cold weather. Protect your exposed skin with warm winter clothing and gloves when working outside. Use the appropriate coverings such as face masks and gloves when working with insulation. As practical as they may seem, venturing into the snow and removing it from your roof can still be dangerous. It is best that you call roofers in Northwest Indiana like Rogers Roofing to do the job for you to avoid unnecessary accidents.